Children learn by doing. When something is fun children want to do it more often. 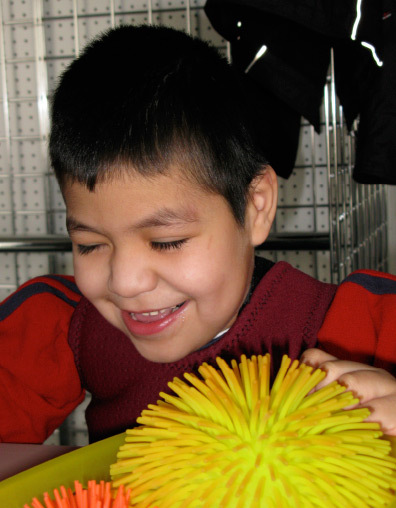 At the TEAMability Learning Center we emphasize learning through actively having fun! How does a child move his body to obtain desired objects? How does a child use his hands to explore an object? What senses does a child use to learn about his world? How does a child tell you that he likes a toy or activity? These questions are answered at an informal assessment conducted by the child’s TEAM. This includes child’s parents, an occupational therapist, a physical therapist and an educational specialist. Their observations become the starting point for the child’s Learning Plan…a roadmap to learning based on the child’s current abilities. The fun begins when children are introduced to a world of activities designed especially to meet their individual needs. The education specialist creates opportunities to learn that are based on what the child like to do, what motivates the child to actively take part. The occupational and physical therapists contribute ideas that allow the child to use all of his motor abilities to enter a world where he can be in charge of his learning…where fun and success lead to learning. Each child is different…learns differently, is motivated differently, uses his body differently. The TEAMability Learning Center offers each child the opportunity to discover and explore his world in unique, customized and specialized environments designed to meet his individual needs. Parents are active participants in the child’s program, contributing information and gaining new skills to help their child learn.